I have had FTTC for 15 months and have enjoyed the 35 Mb/s upgrade against the 1.5 Mb/s I used to get previously. Having bored all my friends rigid saying how good it is I am now faced with a dilemma. A colleague has asked my advice he is currently with Sky LLU getting around 14 Mb/s and is reasonably happy. They have 3 internet users mainly using the service for console gaming, light video streaming, web browsing and the like. They rarely seem to stress their link. They are receiving mail shots from BT saying Infinity is available. He knows he would loose Sky's VOD service and have to pay more but he is excited by getting over twice the speed and potentially up to 80Mb/s (he lives within 100m of his local cabinet). He thought I would give him the killer argument that he could use to convince his partner but I can't. I cannot think of an application that currently requires more than 5 Mb/s other than downloading files (not something they do that much of and in my experience the limit is frequently the speed of the server rather than the link) the two applications he is interested in that do use bandwidth are streaming HD video and cloud gaming but both work well on his current link and he could run two streams comfortably. His latency is fine as is Sky's back haul. So is there something I am missing or is there a speed that currently for the mass user where additional speed is not required? I could see if he had 4 or 5 teenagers around he might need more bandwidth but if they don't fill 14Mb/s would they notice the speed increase to 40? What do people think? Also what would you feel is a fair price for an increase to 80Mb/s over the current 40 Mb/s as this has started me wondering if I will be willing to pay the money grabbing swines (aka BT Retail) for the upgrade to "up to 80 Mb/s"? I would guess they would feel the upload more than anything. Anytime+ while good, does suffer from a lack of HD material, what there is rare apparently. XBox and PS3 rentals are the best I've found generally, a film can be 8GB. But then if they take Sky Movies HD the selection is usually enough that stuff is available. If Netflix appear with HD streaming at a decent price, then my Sky TV service in particular the movies will be under threat. I think you have admirably explained why he cannot justify it to his partner . I think you've hit the nail on the head. 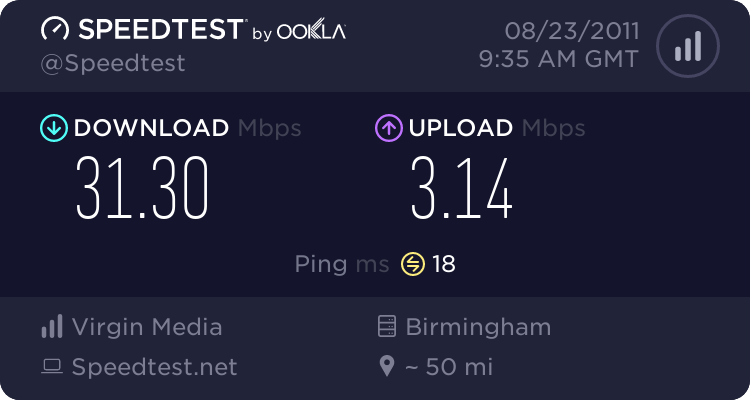 It's possible that HD IPTV might be a driver, especially for a family, but it is hard to explain why any residential property would need more than 20Mb/s right now. What's really needed is for the average to be pushed up toward 20Mb/s but that means telcos have to invest in areas where there's not much profit. I agree that HD IPTV is probably the "killer app" and personally look forward to streaming good quality 1080p video with 7 channel sound track - blu ray is so yesterday. I am also looking forward to Netflix in the UK as Love Film, i-tunes etc don't offer the quality I want for movies. 20Mb/s does seem to be the sweet spot. It will be interesting, as a greater percentage of connections reach that level,if providers like Onlive start to offer new services. Cloud gaming at 1080p with very high frame rates and detail would really be a competitive product against consoles. Their current operation is pretty impressive when you realise what they are doing. OK no need for my friend to upgrade but having unlocked my OR modem today and found it saying that the max download of 95168 kb/s I am catching upgradeitus roll on the 80Mb/s service. In my case I already have access to plenty of HD TV thanks to Sky and by using the PVR features all the time it pretty much gives me the flexibility of IPTV. That means I've been struggling to find a reason to upgrade. It doesn't help that Be are faffing around and taking their time to come up with an FTTC product.